EM’S BEEN WANTING to invite friends over for a playdate ever since we identified the home back in April… mind you, it was a time when she didn’t even have many friends, other than the children of Papa’s colleagues and the two children of Mommy’s friend. 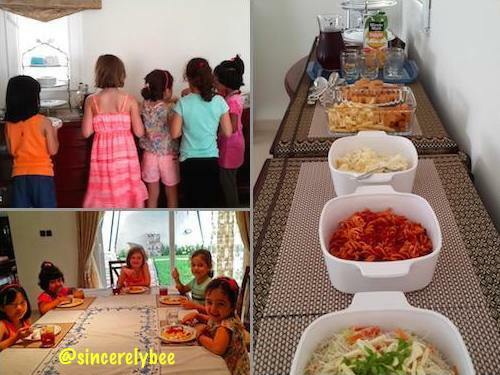 When we finally moved into the house in July and she started school in August, the desire to invite friends over grew stronger… mind you, her room was still in a mess, unpacked boxes still scattered around, and some toys were still in them! The week that we finally agreed to her earnest request, she fell ill and was absent from school for three days. When she finally recovered and returned to school on a Thursday, I went with her and hastily made contact with the parents of her classmates whom she wanted to invite. And that’s how her first playdate came about on this date, Saturday, 6 September 2014. Little Em hosting her first playdate, queued up last allowing her friends to have a go at the food first. Bored of playing toys in her room, they came downstairs… (L) Nafisa played the piano; (R) Playdate or play dead? 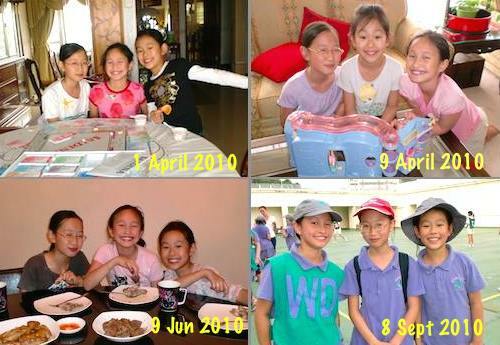 Big M had her share of playdates back in HK with two of her closest friends then, both of whom were in Netball Club with her. Little Em got a tiny teeny taste of playdate back then when she was included by Big M’s friends, at home on 9 April 2010. This entry was posted in African Adventures, Heavenly Hong Kong, HK Missy, Little Miss America and tagged Accra, Friends, Ghana, Hong Kong, Kids. Bookmark the permalink.